A solenoid valve is an integral part of Electro-Pneumatic Control engineering. This valve will control the supply of air to inlet or suction valve in a load/unload operation of a reciprocating air compressor. Different types of solenoid valve are available on the market. Hence in Air Compressor Technology normally open (N/O) or Normally Closed (N/C) type solenoid valve is used to perform loading/unloading action. Impulse air supply through a tube of Dia. not less than 12 mm from the air receiver through control filter connected to inlet port of solenoid valve. 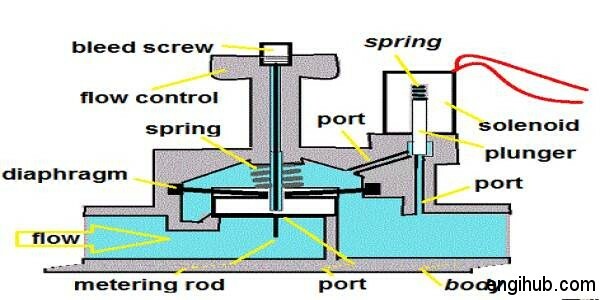 This port is also known as cylinder port. This is connected through, at least 6 mm Dia. Copper or Nylon tube inlet (Suction) valve of the compressor. This port is for the escape of trapped air in the line. It should always keep open to the atmosphere. These type solenoid valves allow air supply to flow from inlet port to outlet (cylinder) port, in de-energized or normal condition. When energized, due to change over in pressure switch contact stops the air supply. This type of solenoid valve is used for load/unload operation of an air compressor. These types of solenoid valves do not allow air supply from the inlet port to outlet port in de-energized or normal condition. When energized due to change over in contact with pressure switch allows air supply to flow through cylinder port. This type of solenoid valve is used in the 5-step control panel for increasing and decreasing the area of clearance pocket during unloading/loading operation of Air Compressor. 01) For the perfect functioning of the solenoid valve, always have an air filter, installed in the airline connected to a solenoid valve. 02) Always see if the nut tightening the solenoid coil is intact. If loose, tighten the top nut.